Folk art is within culture history a term for the rustic style, which flourished in the Swedish farmer society in the end of 15th century. The folk art style gained approval in the time when gourd painters were spread throughout Dalarna, Hälsingland and to nearby provinces. The Swedes were also skillful crafts and handiwork, which meant that the objects were made on the own farm or at by a local craftsmen. 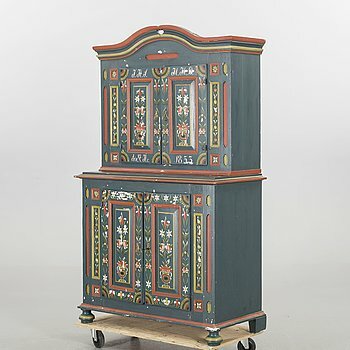 Folk art is symbolized by a solid artisanship and many of the objects were produced in wood, which often were painted in beautiful hues such as “Falu”-red and folk art blue. The decorations on the objects characterized by squiggly flowers and other inspiration from natural beauty, which is a beautiful contrast to the simple and timeless design of the objects. Chests, cabinets, stools and hall clocks are common objects, along with caskets, bowls and different devices used on the farms. Showing all 2 items matching your search criteria. 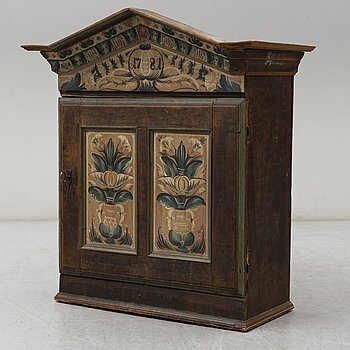 An 18th century folk art cabinet. SKÅP, allmoge, bär årtal 1853.